We have just finished breakfast at a very late hour, mainly due to the switchover to daylight saving last Sunday, which is still playing havok with my already terrible sleeping habits, and have decided to go for a walk before lunch. It’s sunny but only 8°C and there is a northern wind which means it feels like it’s about 4°C. 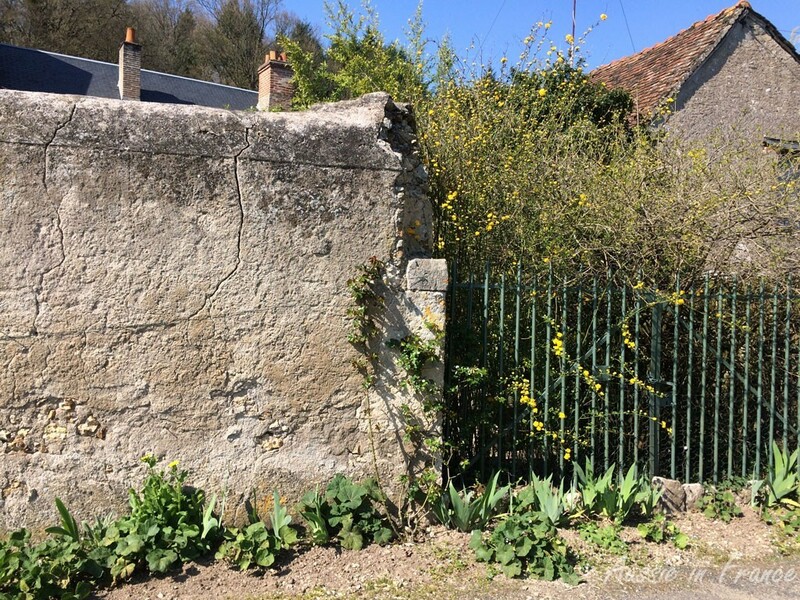 We walk down our very long street towards Blois and turn left at the church, then up the hill and under the overpass, admiring all the flowering shrubs on the way. We take the first street on the left and keep climbing. We are eventually walking parallel to our street, but about seventy metres above. 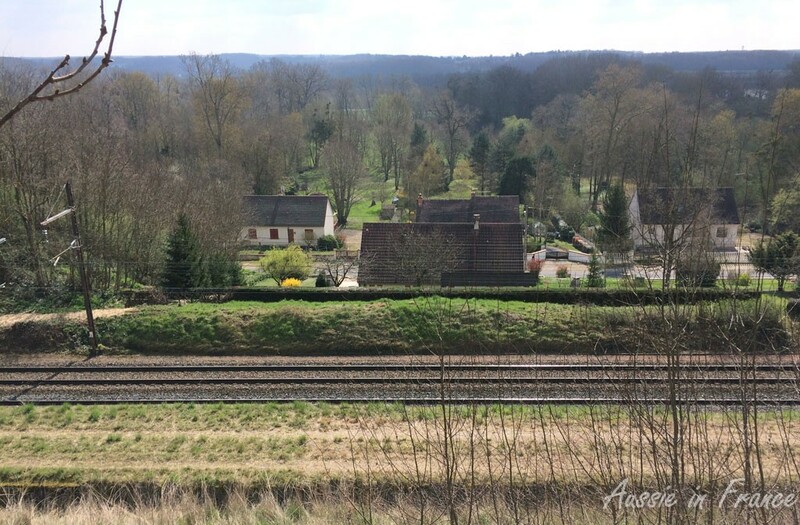 Many of the houses have a spectacular view of the Loire but the noise of the riverside traffic is louder than it is at river level. Eventually we find a track that leads us to the edge of the hillside overlooking the railway line. This is the closest we can get to our house which is two doors down from the last house on the left of the photo. We go back to the main path which eventually leads us to a steep track down through the forest. 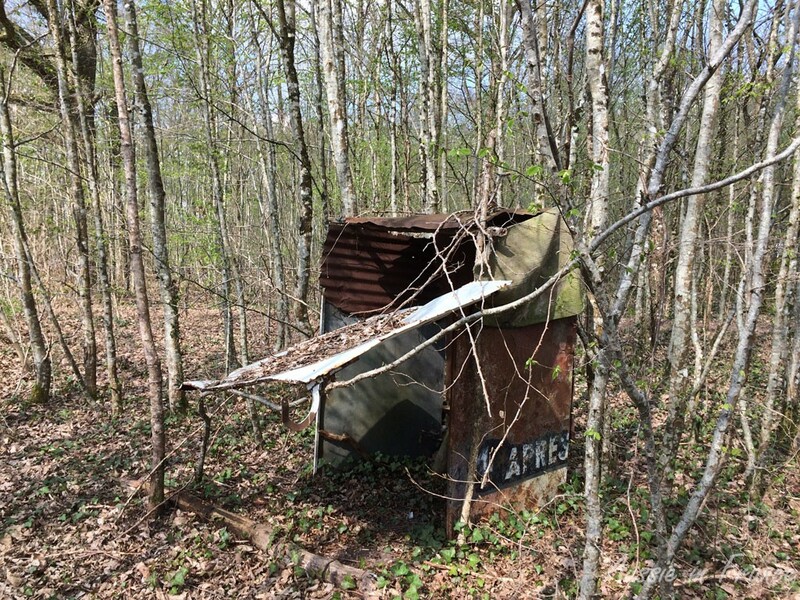 We spy a little cubby house built many moons ago to judge by the materials used – and very un-environment-friendly! 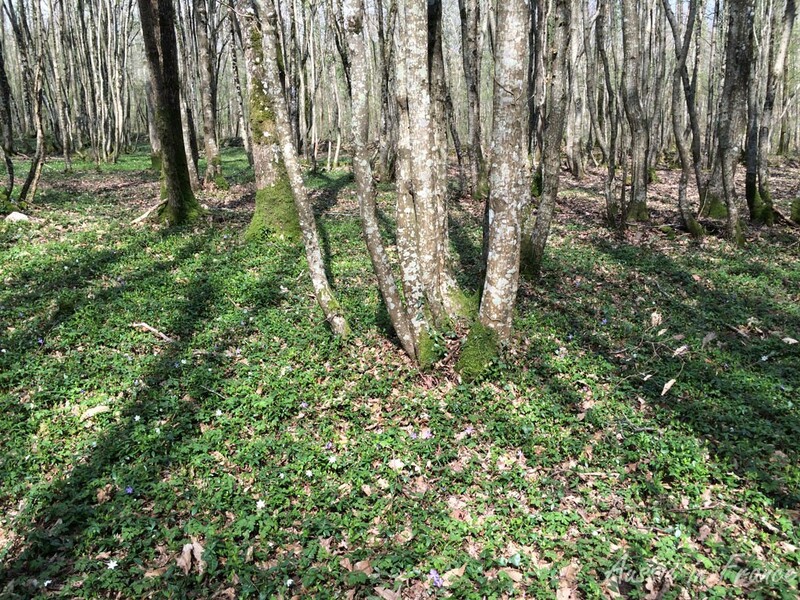 The forest floor is covered in little yellow and white flowers. After lunch and a little siesta interrupted by the doorbell (by the time we emerge it’s too late, the person has already left), I go into the kitchen to start preparing lamb shank for the first time in my life. It’s Easter Sunday after all. With no children or grandchildren around, this is our only concession to Easter which our family has not celebrated since my sister died on Easter Saturday many long years ago. 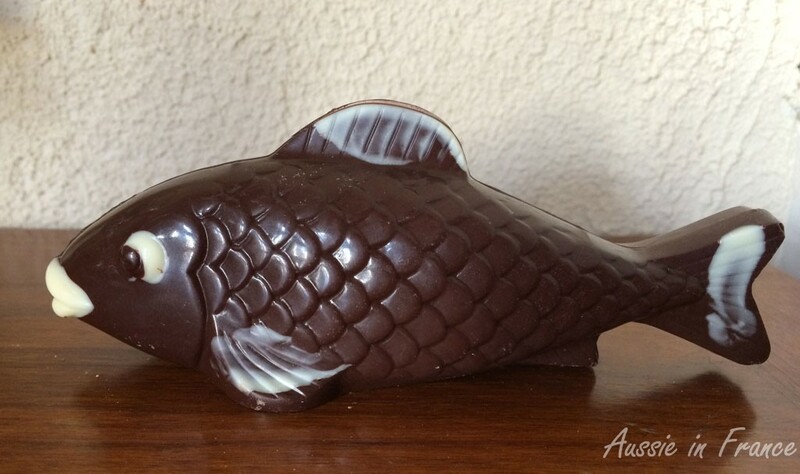 We’ve already eaten our April Fish Day chocolates. 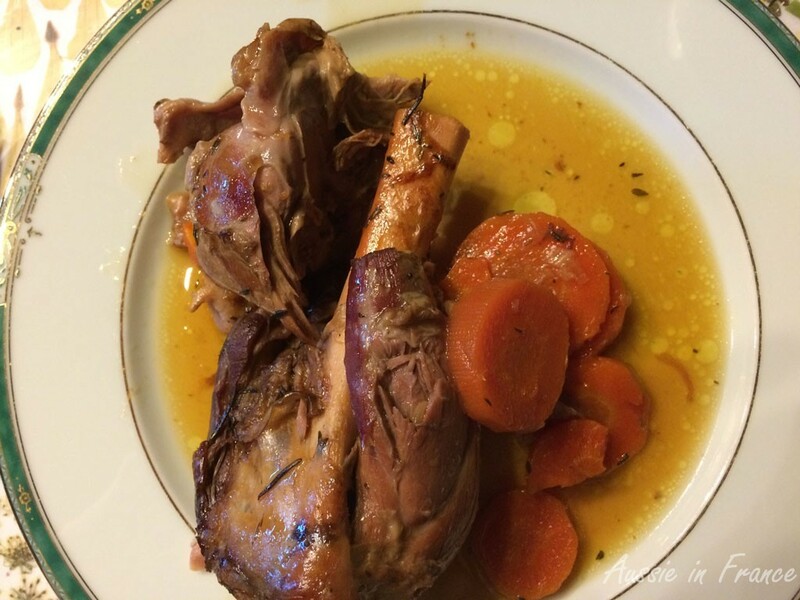 I love lamb shank but you usually have to order it at the butcher’s and it takes a long time to cook. Yesterday at the supermarket, there were four shanks just crying out to be bought. I check out a few recipes on the web, many of which seem time-consuming. Not my scene … I eventually find one that looks easy. You just have to peel and chop a couple of carrots, thinly slice a couple of shallots (which, amazingly, I happen to have! ), peel some garlic cloves, brown the shanks in olive oil in a pan that you can put in the oven, déglaze with vinegar, add the other ingredients along with a bouquet garni (which I go and gather in the garden), a teaspoon of cumin and a tablespoon of honey. Add ½ litre of water (it’s supposed to be beef bouillon but the only cubes I have are chicken), bring to simmering point, cover and put in a 200°C oven for three hours, adding another ½ litre of water halfway through cooking. Easy, huh ? 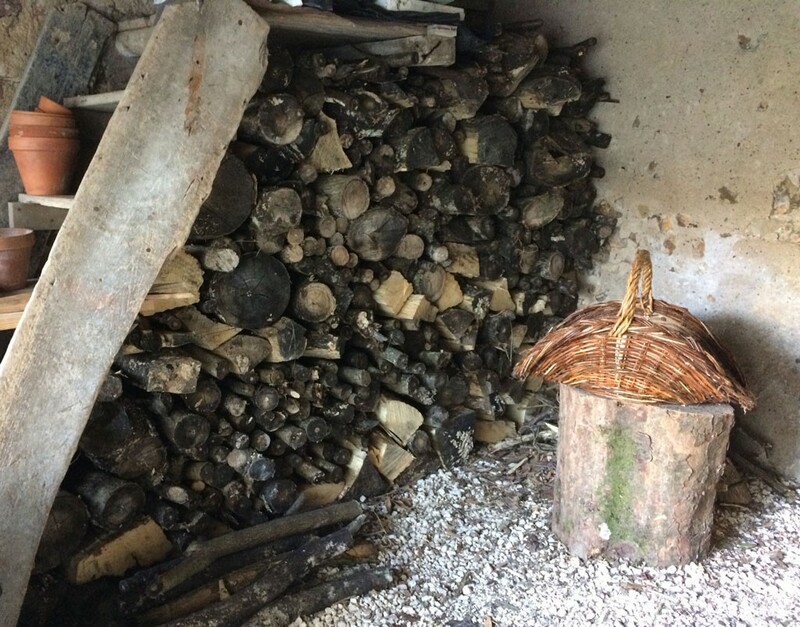 The wood I stacked with the resting block next to it! Meanwhile Jean Michel is up in our little wood filling the wheelbarrow with logs from the ailanthus tree he cut down last year. During the night the pile of logs collapsed making evacuation urgent. He then takes them down to our sheltered wood pile. I play my part by unstacking them after he empties the wheelbarrow onto the ground. Some are a bit heavy but I still manage. I have a little rest on the cutting block while waiting for the next load. It’s much less stressful that having to make sure my logs are exactly 50 centimetres long! It’s time to go and check the lamb. The smell is heavenly – I only hope it tastes as good. My weeded garden bed outside the gate, with flowering forget-me-nots and a yellow daisy affair, and hollyhocks, roses and irises in the making. We follow up with some gardening. 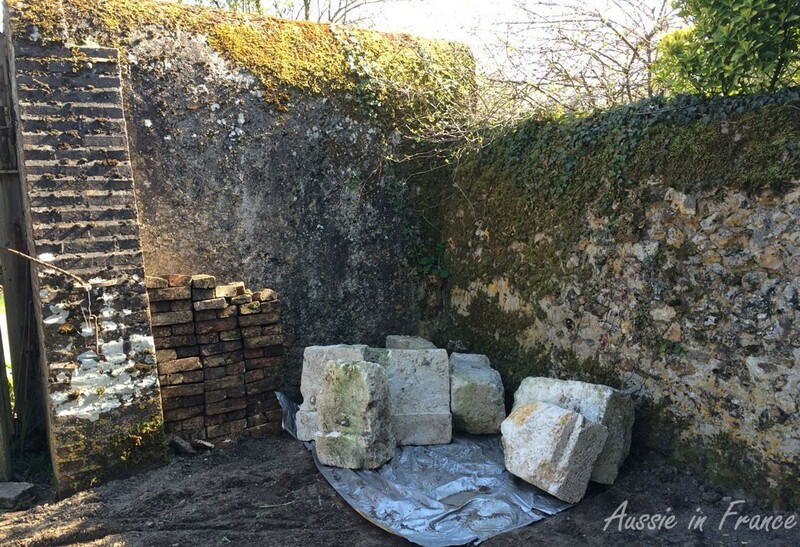 Jean Michel is cleaning an area in front of our little house to store the freestone blocks we’re acquiring at the moment. He unearths about forty refractory bricks which I stack in a neat pile. If we don’t eventually use them, we can always sell them over leboncoin.com! The lamb turns out to be delicious. I serve it with creamy mashed potatoes flavoured with truffle shavings from the truffle we bought at the Truffle Fair and froze in January. We have a red bergerac from the Dordogne to go with it. 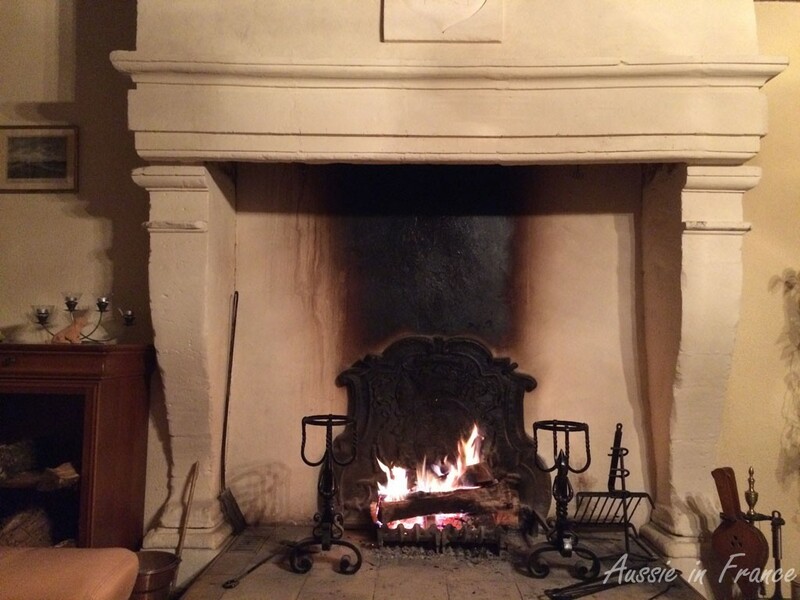 By the time we’re sitting in front of the fire having our decaf espresso, I think that every muscle in my body must be aching which makes me realise how out of shape I am after my flu this winter. Let’s hope the weather is going to get warmer soon so we can be out and about on our bikes again. 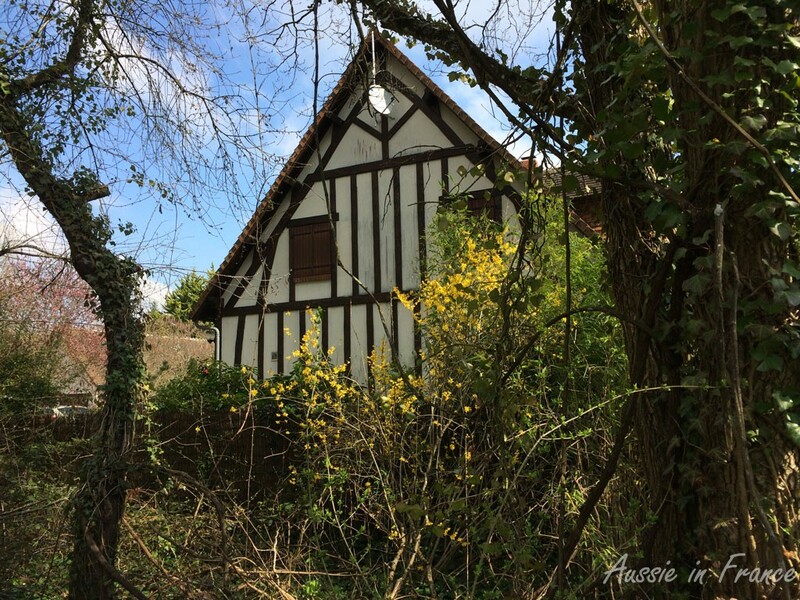 This entry was posted in Country living, Flowers & gardens, Les Grouets, Life in France, Loire Valley, Renovation and tagged spring in the Loire Valley. Bookmark the permalink. 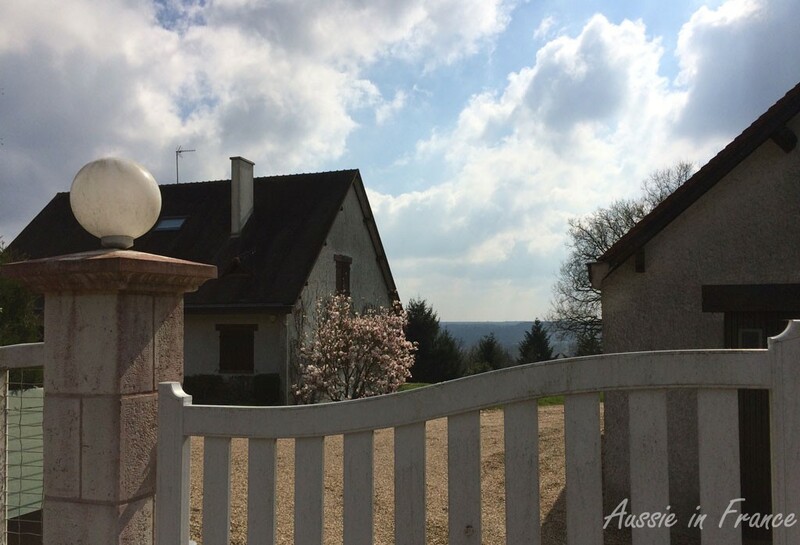 Spring is just so beautiful here – even though it’s not as warm as we’d like! Such a rewarding day with sunshine. You’re waiting for it to get warmer to get out and about and we are waiting for it to get cooler to extend our hiking. We’re never happy are we? Today it’s beautifully sunny again with a cold north wind. And we’ve woken to a lovely, crisp, sunny morning. Perfect for todays walk. Bonne promenade! I hope it goes well. Just had a laugh reading ‘my logs are exactly 50cms’. Yes, whenever JM gets pernickety about something, I remind him of the 50 cm logs! What do they do with them? That’s the question! It all looks and sounds idyllic. The spring sunshine, flowers and woods, the freshness in the air. The work projects and the delicious food. I felt hungry just reading about the lamb and truffle scented mash. It’s already autumn here now – the days are mostly still bright and sunny but the nights are quite cool and there is a real freshness in the breeze during the daytime. Our roses are still blooming but the summer veggies have finished. No more tomatoes. I have a question for you. Hope you can help with some advice/information. In just over two weeks time we’re going back to France again, this time for two months. We’re hoping to be able to buy a pre-paid French sim card to use in our mobile phone. It’s too expensive to put the phone on global roam from Australia so this seems like a good idea? But we’re just not sure if it’s possible or how we’d go about it. We’ll be arriving in Marseille first and will be there for a few days. After that staying at a couple of places on the Cote d’Azur before travelling to Aix and then St Remy de Provence. Finishing up in Paris for a month in the same apartment we’ve stayed at before. After that we go to England. So we’d like to get a sim card and use a service provider that works in both England and France, if possible. Hi Pamela, you’re coming trip sounds wonderful. I have been asked about the pre-paid SIM card before but don’t really have an answer. I suggest you go to the Foder travel forum and ask the question there. The people are very helpful. You could also read http://experiencefrancebybike.com/using-a-sim-data-card-to-stay-connected-when-bicycling-in-france/ (including the comments). Let me know how you get on! Many thanks Rosemary. The data simcard does sound great – but it’s not really what we’re after as we always take a laptop to use with the free wifi in hotels and in the apartment we rent in Paris. We do all emails and internet data stuff on this. Pamela, if it’s just a prepaid SIM, you can buy them in any supermarket! Virgin, Bouygues, SFR and Orange all offer them. Orange’s card is called mobicarte https://boutique.orange.fr/mobile/carte-prepayee-mobicarte. You can pick them up at the airport and in lots of other places. I don’t know about other European countries though.